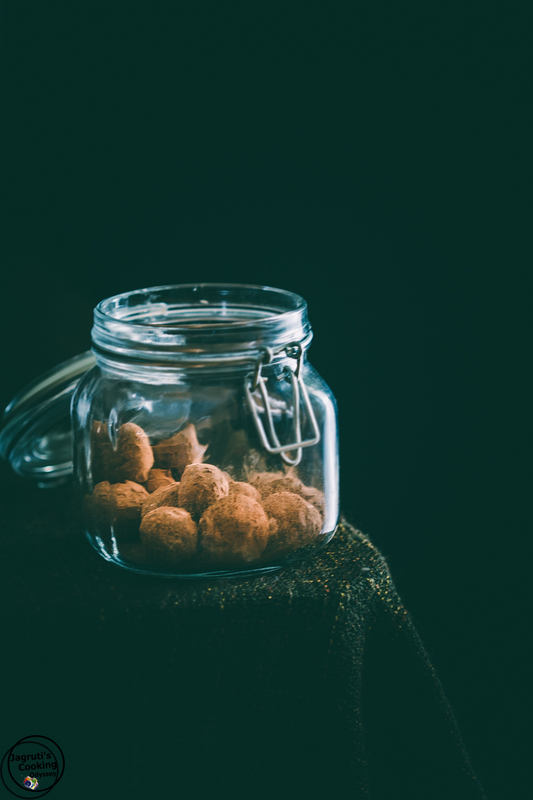 Treat yourself or your friends and family right with these extra dark and dreamy, healthy and fuss free Vegan Mocha Chia Seeds and Mixed Nuts truffles on any occasion or just grab one and pop in your mouth whenever you are low on energy. They are darn easy to whip up, a batch of these can be made within 5 minutes just with a some good-for-you ingredients. All you need is a food processor to blend everything together. From time to time I whip up healthy and fuss free treats like No bake buckwheat and cacao bars, , No bake coconut and fox nut bars, No Bake protein packed Bites , definitely I would bake this comforting Masala Chai Tea Granola Bars. when I have lots of time on my hands. These truffles are sweetened with soft and juicy Medjool dates, and healthy fats derives from raw nuts rather than cream or butter, and obviously these little tiny but mighty chia seeds are here to perform their magic. That means each of these little delicious truffle has healthy protein and fibre along with chocolate and coffee deliciousness! Whenever daughter visits us over the weekend, I always make an effort to prepare some nutritious treats for her to take with. She loves Medjool dates, that takes care of her sweet cravings. According to health experts Medjool dates are the healthiest natural sweetener with bucket full of good benefits. 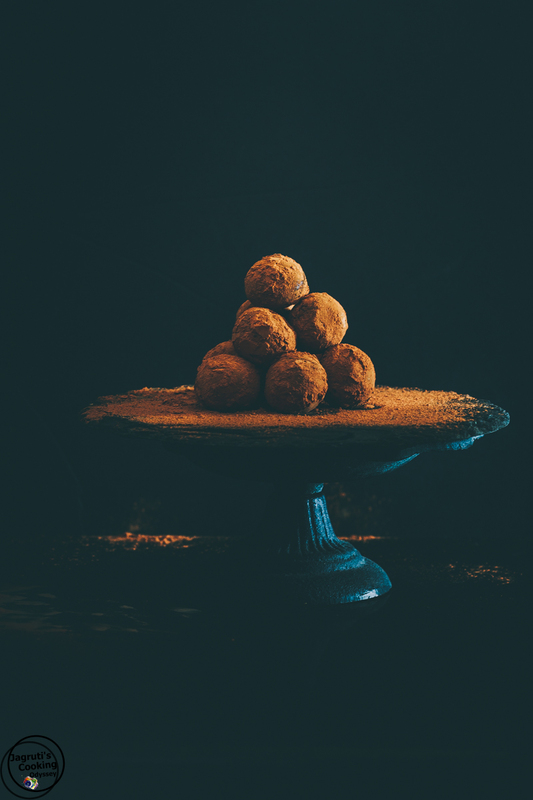 The base of this recipe is dried fruit, but they don't contain any refined sugar, the dates in these truffles makes them sweet, but they won't send you in sugar coma as nuts and chia seeds will balance it out as they are full of protein. Chia seeds are my favourite go-to add in for so many things. 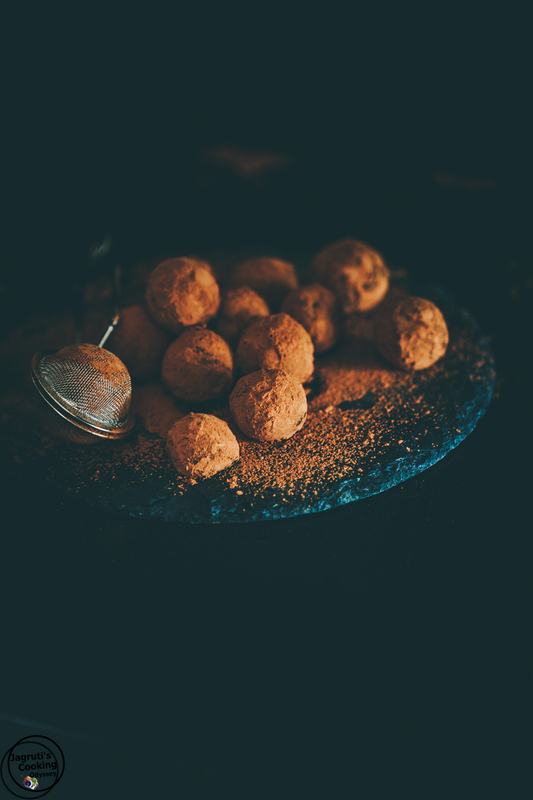 These filling and portable truffles are addictive, but if you are trying to keep things on a healthy side you don't want to devour the whole batch in one go. Have just one or two as treat! These truffles make an perfect edible gift for those who appreciates homemade and healthy stuff. Are you thinking what I am thinking?, these truffles are the perfect solution, why don't you prepare these truffles and give it to your mum as a Mother's Day gift, because mums love edible gift because they are delicious and come straight from the heart. Instead of mixed nuts, you can prepare these truffles only with one kind of nuts. Omit coffee powder to make this completely raw. Unsweetened Cocoa powder can be used if you can't get hold of raw cacao powder. If you are not using high quality soft dates, soak them in a warm water for half an hour, then discard the water and dry off dates very well. 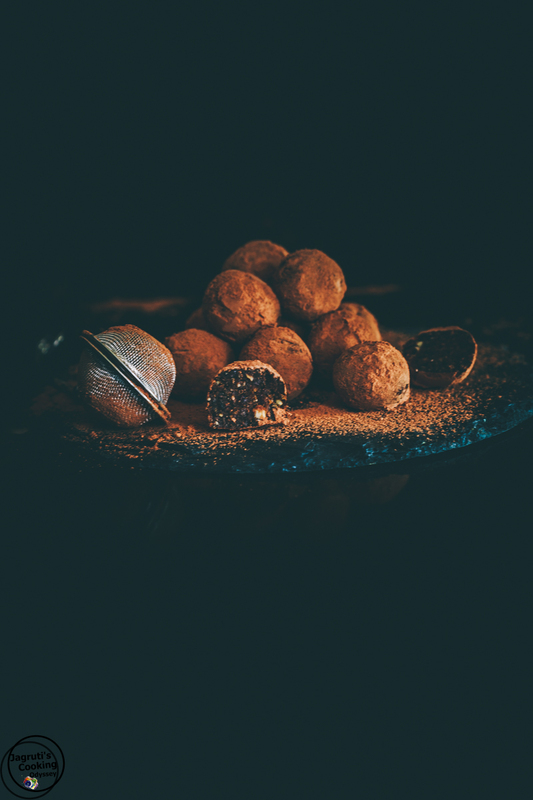 Although these truffles are made with good-for-you ingredients and 100% natural be sure not to binge on these, especially if you are suffering with high sugar levels as they contain a lots of sugar from dates. Vegan Mocha Chia seeds and Mixed Nuts Truffles in 5 minutes! 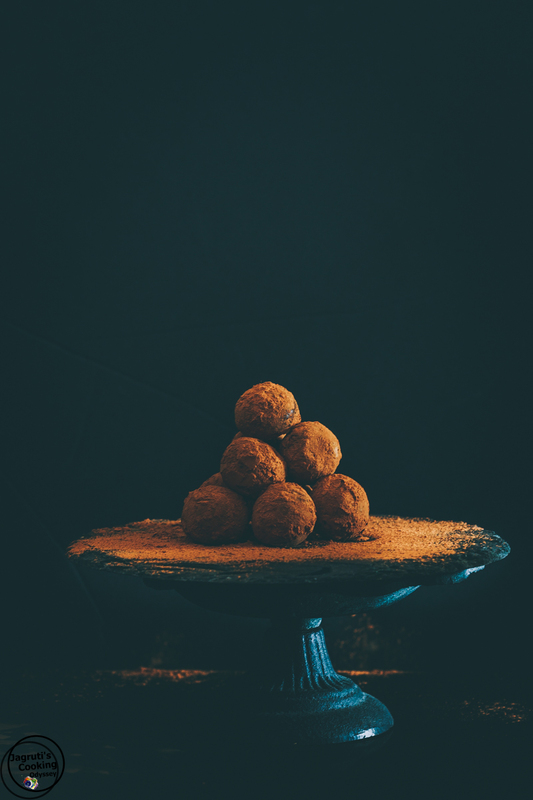 These truffles are made with healthy ingredients like medjool dates, rich nuts, chia seeds and flavoured with raw cacao and espresso powder. Now add all the remained ingredients (leave 1 tbsp. cacao powder) to it and blend everything on a high speed until you have thick and sticky dough. Roll the dough mixture into small balls and place on a plate or baking sheet and roll them in a cacao powder. A wonderful gift for Mother's Day. 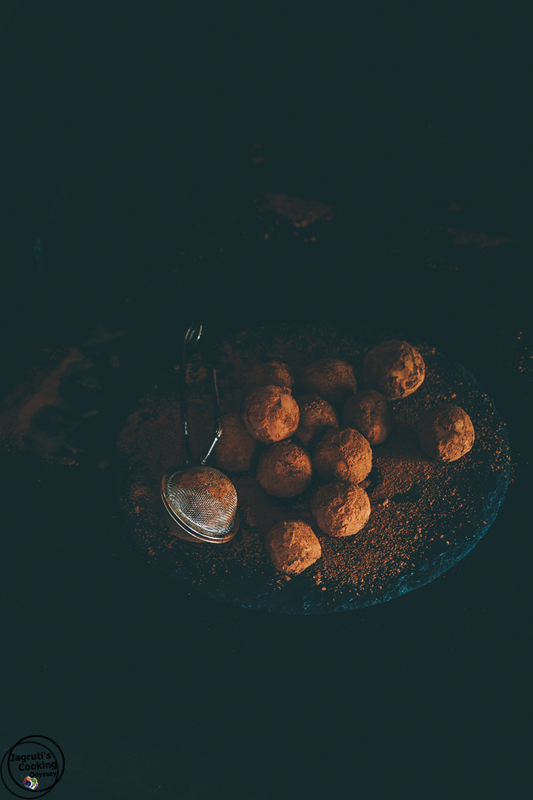 Love making these balls of healthy treats. These sound so good. The perfect snack for anytime! Thank you Stephanie:)yes they are. You're the only person I know who can make "healthy" look positively "decadent!" Yum! Love mocha. Love chia seeds. Love everything about these treats!! Can't wait to give them a try!! I love that you've made a healthier option for such a decadent treat. They look and sound amazing! Awesome truffles!! Love anything with dates and nuts and of course with coffee, cannot resist :) :) Beautiful clicks too!!! Oh my those pictures are gorgeous!..I love truffles and I can't wait to try this recipe..I have all the ingredients on hand, fantastic! Eye catching and tempting pics.. Makes me drool for some now!! Omg, literally breathtaking pictures. I love these easy and healthy kind of fuss free treats. Bookmarking to try them soon. Amazing clicks Jagruthi. Those are such healthy and delicious treats. My mouth is just watering here, such a delightful truffles, cant resist to those dark beauties.